Amazon offers a software as a service ecommerce platform with solutions ranging from a quick shopping cart for individual sellers and small businesses to enterprise level services. What’s more, Amazon promises that its Webstore solution is both good quality and easy to use. Amazon is one of the ecommerce business’ proverbial 900-pound gorillas with more than $13 billion in revenue for the quarter ended March 31, 2012. The company seemingly has been placing some marketing emphasis on its Webstore, producing happy-customer videos and promoting it with advertising. The following video, as an example, shows how a manufacturer of food products launched its online store using Amazon. Given that the ecommerce platform or shopping cart that a small business chooses can have a significant impact on success, seeing just what it would take to set up an Amazon Webstore seemed like a practical topic to cover here. Not surprisingly, registering for an Amazon Webstore begins with providing some basic business information. 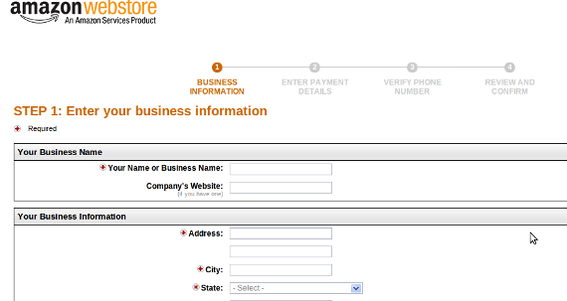 As expected, launching an Amazon Webstore begins with filling out a form. Amazon will also want the new business’ credit card information. After entering the payment card data, Amazon will ask to verify a telephone number. This ensures that the service can publish that telephone number to customers. 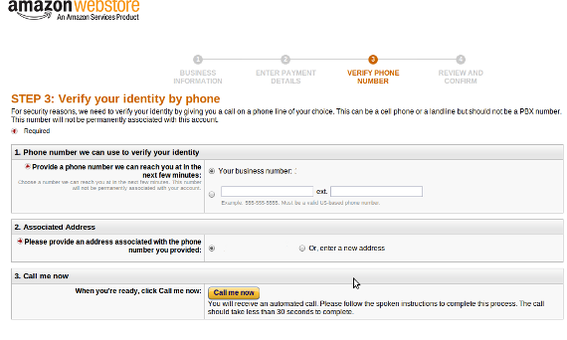 Amazon’s Webstore also requires telephone verification. Amazon has relatively lengthy terms and conditions. Scanning this section will be the most time consuming part of the registration process. At the end of the registration process Amazon asks new merchants to watch a promotional video. It may take a few minutes before a Webstore account is active and a new merchant can log in. Unfortunately, Amazon’s error messages are not really clear and helpful. It may be a few minutes before a merchant can access the new Amazon Webstore, but unfortunately this is not communicated well. Amazon Webstore has a product import tool for merchants already selling on another platform. Products may also be uploaded via a file, or products may be manually input. Amazon begins by asking for an item name or UPC. When entering products manually, Amazon will search its databases for images and descriptions, potentially saving new merchants a lot of time. Amazon will search its database for matched products. 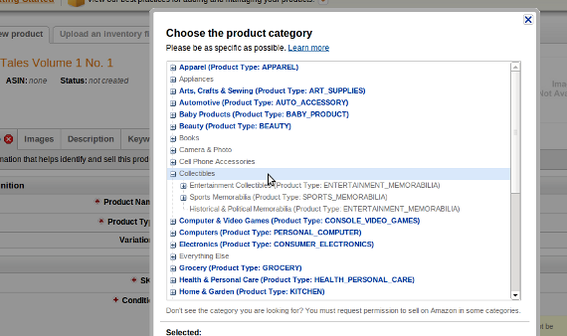 Amazon has a complicated category system that will force some merchants to confirm to the Amazon.com hierarchy. What’s more, once a product’s category is set it cannot be changed. For this article, the store being developed was selling comic books, but Amazon’s Comic Book and Graphic Novel section was not available without an additional approval process. Amazon has a significant category system. Another big stopper is that Amazon only allows users to sell new products at the moment. Amazon offers a number of very basic templates to help merchant get started. The new Webstore site may then be updated with CSS and HTML. The bottom line is that it is possible to have a great looking site with Amazon Webstore, but it is going to take some design expertise. 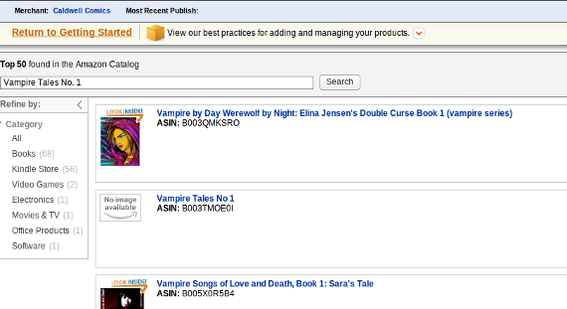 Amazon Webstore can be made to be very attractive. Merchant will still need to apply for payment processing either with Amazon’s checkout, Checkout by Amazon (these are different) or a third party processor. Amazon Webstore had a few pricing packages at the time of writing. A new merchant could purchase just the Amazon Webstore for $24.99 per month, plus a 2 percent payment-processing fee on every order. Or the new merchant could get both the SaaS Webstore cart and enroll in Amazon’s Selling on Amazon program for $54.98 per month. This section option also has a 1 percent payment processing fee for orders in Webstore and a 6 percent or greater fee for items sold on Amazon. A third less publicized package allows users to combine Webstore, Selling on Amazon, and Fulfillment By Amazon. This option’s price is variable and includes many fees. Amazon also charges a fraud prevention fees. Amazon is a leader in the ecommerce industry and Webstore is a way to tap into that leadership, but the platform is not terribly easy to use and may require help from a designer.